FEATURE: 03.20.19- It’s the first day of Spring and in addition to sprucing things up around one’s living quarters, Mac users may be thinking about doing the same with their computers but whether you’re upgrading the storage capacity of a solid state drive (SSD) in a newer machine or replacing a hard disk drive (HDD) in an older one, do you know everything there is to know about SSDs going in to its purchase? SSDs, which have been standard across the board in all Macs in recent years, were use first by Apple in its hardware in 2010 for both the 11-inch and 13-inch models of the MacBook Air (it was a BTO, build to order, option in the very first MacBook Air in 2008). Compared to hard disk drives, sollid state drives — aside from being quieter because they make no sound at all — are much faster in general and since it does not have any moving parts are not prone to most drive failures associated with such which can help safeguard data, making those characteristics more beneficial and usually why people who own older Macs choose to upgrade and swap out their HDDs in favor of SSDs. 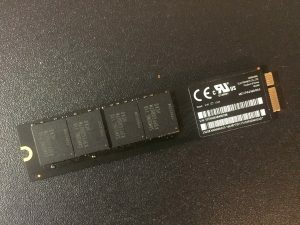 There are a handful of sources for SSDs for the Mac from OEM, original equipment manufacturer, drives like Samsung or third party drives like those sold by Crucial and Other World Computing (also known as OWC and sometimes macsales.com). However, before you purchase or acquire an SSD and upgrade your Mac, it might be good to know — besides making sure the drive is compatible for your particular machine as your computer model may require a specific make and style — some vocabulary used to describe solid state drives,. SATA- which is short for Serial ATA, is the primary standard for 2.5-inch solid state drives and can come in SATA II or SATA III (in two versions, 3Gbps or 6Gbps) speeds and while backwards compatible will only run at the bus speed of the particular connection on the computer. PCI Express- some SSDs with a PCI Express interface are designed to fit in a desktop computer expansion slot. NAND Flash- are the silicon chips found on an SSD where data is written to and stored which come in three types (SLC, MLC, and TLC) and those determine how much data can be written to each memory cell, its stability factor, its lifespan, and finally, cost. Z-Height- is the thickness of the SSD which is generally 7mm or 9.5mm (the former of the two has been the standard in recent years) and depending on if it is installed on a desktop or notebook computer, the Z-height is very important to consider especially in the latter. Controller- as the name implies, is a silicon chip on the SSD that controls functions like a “traffic cop” and is one of the key characteristics that differentiates SSDs from various manufacturers. Write Cycles- a measurement of how long an SSD will last and is an indicator of the endurance factor of a drive and the amount of instances its memory cells can be written to and erased. Wear Leveling- SSDs use this method of managing write and erase cycles, which are limited, by spreading them out evenly over the memory cells of the drive in order to achieve maximum life. TRIM Support- the automatic process that deals with the method of clearing memory cells of data to be erased in order to prepare them for use for writing to when needed which is a huge factor in the speed and performance of a drive. Over Provisioning- a number of SSD manufacturers provide more memory cells than the main storage capacity of the drive in order to allow for backup storage when the primary cells reach their end of life (in some cases, the term also refers to a feature of the drive that spreads written data across all memory cells on the drive, both primary and extra, in order to extend the longevity of the SSD). MTBF- which stands for meantime between failures, is the specification which measures the failure rate of an SSD among drives made by manufacturers (it is not the failure rate of a drive in usage hours but the average for a particular model of drive that is manufactured). For additional information and the complete list of 20 terms, read the original article written by Burek on the website of PCMag magazine. And for tips on how to delete data off an SSD securely without causing damage to the drive, check out this guide published on “The Rocket Yard” blog by Other World Computing. Note from the Author: for full disclosure, this writer is a past customer of Other World Computing and has purchased various items from the company over the years, among them, one of their SSD upgrade kits made for the Mac.